I’ve got to admit that I was really struggling coming up with a joke with Clara in it. I mean, I did the Lion King joke when Annika came to the world, and I didn’t feel like repeating myself. And then I couldn’t come up with anything for the longest time. And on top of that we had my mother in law come to visit and the general stress about having a newborn and a 4 year old at home. Yeah, as you can imagine I didn’t have a whole lot of time working on the comic. BUT as it turns out, this comic strip is actually based off of a real present we got! 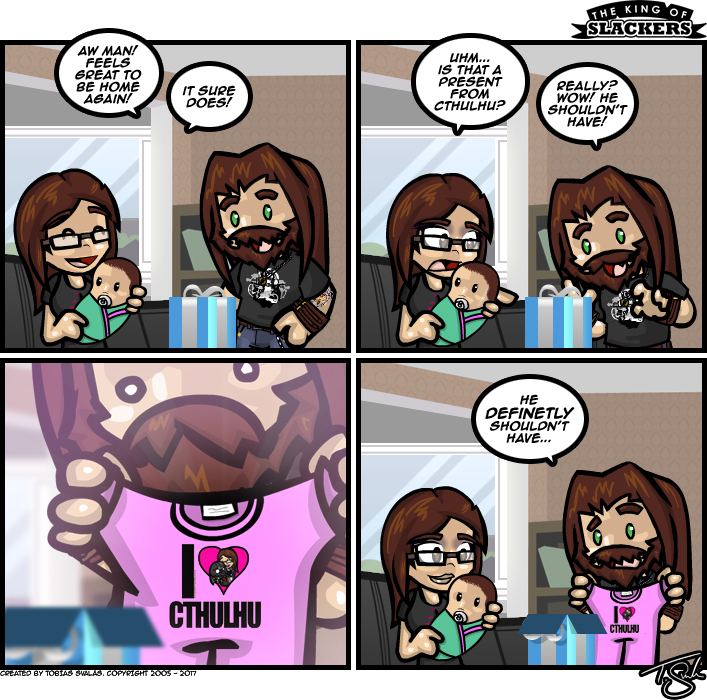 My sister in law ordered a pink baby one-zie with my anchient “I <3 Cthulhu” print on it. And it was freakin’ awesome and needless to say, we loved it! What made the one-zie even better in real life is that it also has a light pink ballerina tutu! OMG! THE CUTENESS!!! So thank you Candace and the Sharman family for the awesome-pants gift Thank you!